See anything unusual in the photo above? Like a table and two chairs waiting for some Greek gods to share a meal up on the bridge? No need to rub your eyes, the furniture set is real. I’m not that good at Photoshop, trust me. 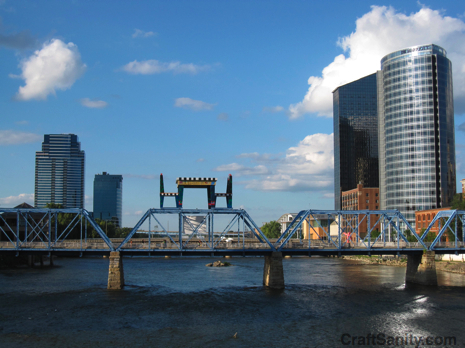 Unusal sightings like this are about to become the norm here in Grand Rapids, Mich. where more than 1,262 artists from all over the globe are vying for a $250,000 award in the first ArtPrize competition. The event officially begins Wednesday, but installantions are well underway. I’m still fighting off a most stubborn sinus flare up which has prevented me from getting out there to start interviewing artists, but I hope to shake this thing by Wednesday. My plan is to post photos and ArtPrize tidbits everyday, so check back for coverage mixed in with the usual CraftSanity content. I’m very excited about this competition and all the art I’m going to see between now and Oct. 10. I’ll collect as many stories as I can and share them here with you. Last Friday, my daughters and I went on a walking tour of some of the outdoor installations after their ballet class. It was kind of a spontaneous art adventure, so the girls were running around the city wearing tennis shoes and dance clothes. But one of the cool benefits of being 3 and 5 is that you can pretty much wear whatever you want and still look cute. I wrote my Sunday GR Press column about our pre-ArtPrize adventure and my feelings about living in a place that celebrates art this way, so stay tuned for that. 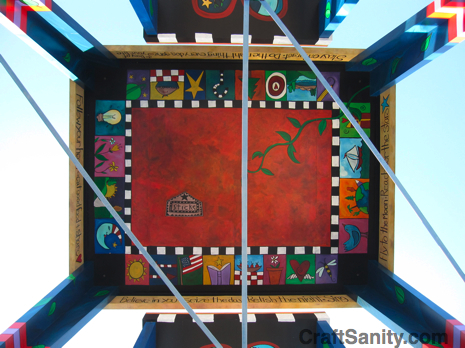 Okay, back to the super-sized table and chairs titled, “The Furniture City Sets the Table for the World of Art.” This 15-ton set is the result of a collaboration between architect Stephen Fry and Des Moines artist Sarah Grant. As reported in the Grand Rapids Press, Fry spotted Grant’s whimsical “Sticks” furniture line at Good Goods, in Saugatuck and asked her to paint the giant table and chairs with the affirmations and happy drawings that have become the trademark of the collaborative art studio she founded in 1992. I love the story behind this piece because, like Fry, I’ve become familiar with Grant’s work via my frequent visits to Good Goods. I’ve lost count of how much time I’ve spent admiring the Sticks brand furniture. I have yet to add one of these fantastic pieces to my home collection, but I’ve really enjoyed the browsing experience because I always end up reading the affirmations off every piece of furniture. It’s really that fabulous. And maybe someday, I’ll own a piece. 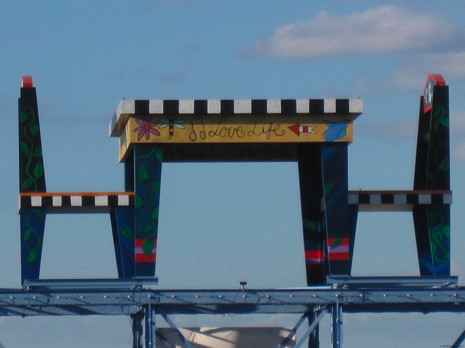 So imagine my delight when I was able to stop in the middle of my favorite Grand Rapids Bridge and read affirmations from the underside of a table that seems tall enough to touch the clouds. It was kind of like Alice in Wonderland only better. There’s talk of using the table and chairs as picnic shelters at a park after the competition. Don’t you just love that idea? See what went into making this set here. Pretty cool, eh? Okay, folks, check out the ArtPrize site and tell me what intrigues you. If you can’t be here to see this yourself, let me help bring the competition to you. Hi! I know this is kind of off-topic but I needed to ask. Does managing a well-established blog like yours require a lot of work? I am brand new to blogging but I do write in my journal everyday. I’d like to start a blog so I can easily share my experience and feelings online. Please let me know if you have any kind of ideas or tips for new aspiring bloggers. Thankyou! What’s Happening i’m new to this, I stumbled upon this I’ve found It absolutely useful and it has helped me out loads. I am hoping to contribute & aid other customers like its helped me. Great job.